If your driveway, sidewalk or patio has uneven surfaces due to sinking concrete, you'll be happy to know there is an easy solution. Sinking concrete doesn't have to be a problem anymore! PolyLevel® is an alternative solution to traditional mud jacking that lifts concrete slabs to a level position with less weight and destruction. Here are some examples showing the difference PolyLevel® can make for homeowners in Superior, Duluth, Minneapolis and nearby. Call today to get started with a free estimate! Sinking concrete can create a serious tripping hazard. Here, you can see that by leveling the concrete at the foot of the front door to this home, tripping hazards can be eliminated and safety can be improved. The drainage path on a concrete patio is important. Once concrete sinks, it can result in water going where it shouldn't, resulting in drainage problems. In this example, concrete lifting solved this home's drainage problems where this patio abuts the house. In this example, parking the car in the driveway was like climbing Mt. Everest! Lifting the driveway apron made parking the garage less of an ordeal. A sunken patio can be a safety liability and diminishes the aesthetic appeal of your outdoor area. This example shows a patio that was lifted back to its original position so it is no longer dangerous and unsightly. Not sure who to call for concrete leveling or repair on your Minnesota and Wisconsin property? DBS is your local foundation repair contractor providing quality solutions for raising sunken concrete. We repair uneven concrete with our fast-curing and effective PolyLevel® injection foam. 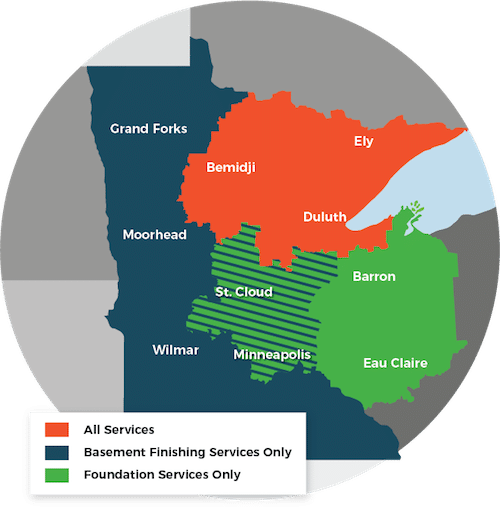 Contact us to schedule an estimate for concrete repair using PolyLevel® in Cloquet, Two Harbors, Hermantown, St. Paul, Esko, Virginia, Ashland and other local areas. Why does outdoor concrete sink? How to lift sinking outdoor concrete to a level surface?